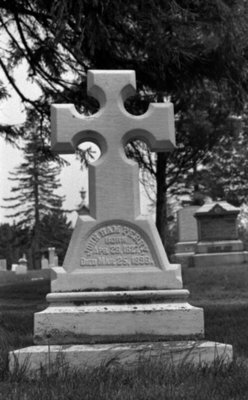 A Black and white photograph of John Ham Perry's gravestone in Union Cemetery, Oshawa, Ontario. John Ham Perry (1827-1896) was the youngest son of Peter (1792-1851) and Mary Perry (nee Ham; 1795-1881). In 1852 he married Jane Margaret Hall (1828-1881) of Quebec. The couple had three surviving children: Peter (1855-1931), George Dinsbaugh (1858-1948), and Margaret (1860-1950). In 1836 the family settled at Whitby from Addington County. After the death of his first wife, John married Louisa Hay (1864-1942) of Brooklin in 1888. They had two sons, John Ham Perry (1892-1976) and Cullen Hay Perry (1893-1918). John Ham Perry worked with is father, Peter, in the mercantile and grain trade and carried on with the business after his father's death. In 1853 he was appointed County Registrar and later served as Deputy Reeve and Reeve of Whitby for many years. The Perry family emigrated from Massachusetts following the Revolutionary War. In 1788 Robert and Jemima Perry and their ten children and settled at Bath, west of Kingston. John Ham Perry Gravestone, Date Unknown, Brian Winter. Whitby Archives A2013_004_457B.